To report a pothole online visit www.wandsworth.gov.uk/potholes or email onstreetservices@wandsworth.gov.uk. The council’s street repair project has now seen more than 10,000 potholes filled in. The repair total has been unveiled just days before Wandsworth’s pothole and pavement repair teams begin a second sweep of the borough. The teams are close to completing a seven month-long pothole blitz, which has seen three crews going into every ward in the borough to fill in problem potholes – to-date they have repaired 10,124. During this time a further three repair teams have been making their way across Wandsworth carrying out footway repairs. Since the pothole blitz began, the borough’s three repair crews have filled in more than 10,000 potholes across 20 wards. This month they have fixed 401 potholes in Bedford, 426 in Latchmere and 448 in Graveney. The pavement repair teams have spent November working in Queenstown, East Putney and Furzedown. Previous months have seen 1,052 pothole repairs in Nightingale, 942 in Queenstown, 932 in Roehampton and 711 in East Putney. Each month the repair crews have been focussing their efforts on specific wards before moving on to the next scheduled area, with the ultimate aim of covering the entire borough. Cllr King said the improvement project had been made possible thanks to shrewd management of the council’s finances, which has enabled this year’s road repair budget to be increased to £6.4m. The work is linked to the Cleaner Wandsworth campaign, which is working to make the borough's streets the cleanest in the capital. As part of the pothole and pavement repair project, many roads are being completely resurfaced and some roads will have their pavements completely re-laid. 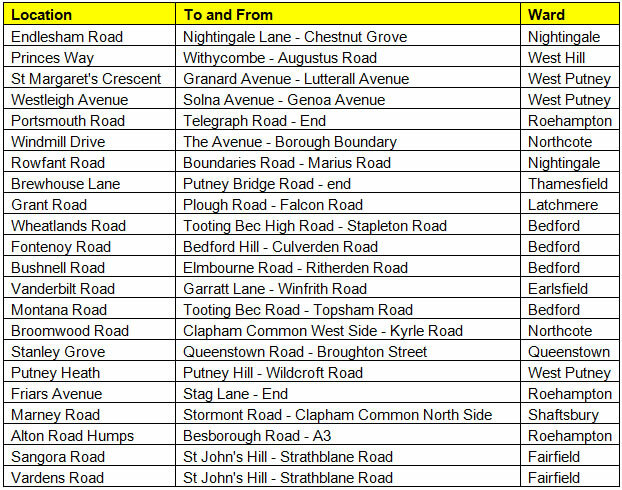 The table below shows some of the roads that have been resurfaced so far. The Council is responsible for 1,500 roads stretching over 360km with 746km of pavements, many of which were constructed more than 100 years ago.